Summer Camp is a great place to learn new skills and try new things. We have a lot of great activities at Tockwogh because we think a good camp should have something for every kid. So for campers who want to ski and play sports all day, we have the right mix. For campers who enjoy outdoor education and sailing, we have the right mix. And for campers who love horses and swimming, well we have the right mix for you too. Each section below gives a brief description of our major program areas. The classes and what is taught vary by age and ability level, but this information should give you a good idea of what we do at camp. Open to all ages and ability levels, sailing is a great lifelong sport that teaches teamwork, collaboration, and confidence. Our camp fleet includes Flying Scots, Optis, Sunfish, and a Catalina 27′. There are few better sailing sites than the Chesapeake Bay, and our staff are just as happy as the campers to be out on the water teaching. Come find out what makes Tockwogh one of the best water sport camps in the country. 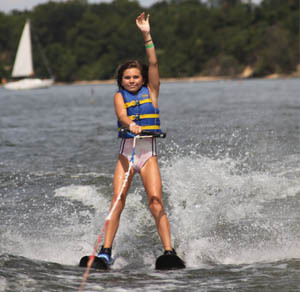 Wakeboarding and water skiing are two of the most rewarding activities on camp. There is nothing like the smile of a camper getting up on skis for his first time or landing her first trick. That kind of confidence building accomplishment is one of the great opportunities we offer at Tockwogh. Built on a progressive program, campers move up to the next level after successfully demonstratigng certain skills. Both programs are open to all ages and abilities levels. 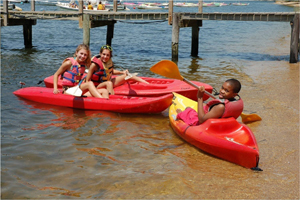 Another great way to enjoy our ideal location on the Chesapeake is the canoeing and kayaking class. We offer an introductory program to the sports based on basic skills and fun-filled activities. Open to all age groups. Our windsurfing class takes advantage once again of our great location on the Chesapeake. Like wakeboarding and water skiing, this activity is great for confidence building as campers take on the challenge of windsurfing. We instruct at beginner and intermediate levels. This program is for older campers – grades 6-9. One of the best parts of being outdoors during the summer is getting to experience the natural world around you. Our outdoor education program is a great way to learn more about nature and how to live in it. From bay studies to outdoor cooking, the activities are focused on appreciating our environment and learning how to appropriately interact with it. Kids are so technologically driven these days; we hope to expose kids to alternative activities that they can enjoy in the great outdoors. Open to all ages. If you can think of a sport we probably play it at Tockwogh. Our goal with our athletics programs is to teach basic skills in a fun way. It is camp after all, and we enjoy being able to play. The following are sports we offer: moutain biking, archery, tennis, soccer, baseball, softball, voleyball, touch rugby, cricket, flag football, lacrosse and basketball. In addition to the traditional sports we also have some Tockwogh favorites like matball, dogdeball, and floor hockey. If you have your own equipment you are welcome to bring but do not need to. We are fortunate enough to be able to offer this great traditional camp program. Being around horses is an amazing feeling that not everyone has a chance to experience outside of camp. For more information about this part of our Traditional Camp visit the Equestrian Program page. There you can learn more about our Trail Rides, Riding Lessons, and Equestrian Camp. 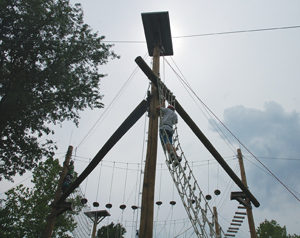 Sometimes called the Challenge Course, this is another activity campers do not generally have the opportunity to participate in outside of camp. At Tockwogh, all of our 6th and 7th grade campers (Chickasaw and Iroquois villages) spend a day each session out on the Challenge Course with their cabin group. The day is spent focusing on a combination of team and individual challenges. Campers get to test their mental and physical limits while being safely monitored by our well-trained staff at all times. This is an excellent opportunity for building relationships and leadership skills. The summer is hot, and there are few better ways to beat the heat than spending a period in the pool. Whether it is relaxing on the pool lawn or hopping in for a game of water basketball, the pool offers a great way for campers to break up the warm summer day. Even if you do not sign up for the pool, you will still visit it several times during the session for cabin activities and other special events. Open to all ages. Few activities feel like camp as much as arts and crafts and jewelry-making. We have grown well beyond these basic activities and have our own take on camp art programs that now includes: guitar, drawing, creative writing, painting, dance, drama, photography and cooking. These activities are great ways to break up the active day and slow down a little, get in some shade, and use a different part of the brain for a while. Activities open to all ages.